Oft maligned as a humdrum 1960s concrete jungle in the same vein as Coventry or Slough, Croydon is nevertheless an important hub for South London and indeed substantial parts of Surrey and Kent. East Croydon station is actually the busiest in all of Greater London apart from the central termini, which - if you don't know the area - gives you some idea of its prominence. Following this months thunderingly calamitous election result, which was even worse than my pessimistic prediction, Croydon Central is also our nearest Labour seat. As I say, can't have everything. 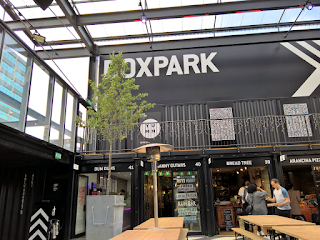 One thing we do have now in Croydon, right bang in the centre, immediately next door to East Croydon station and therefore impossible to miss, is a shiny new BOXPARK. Which means eating, drinking, socialising, and general happeningness. 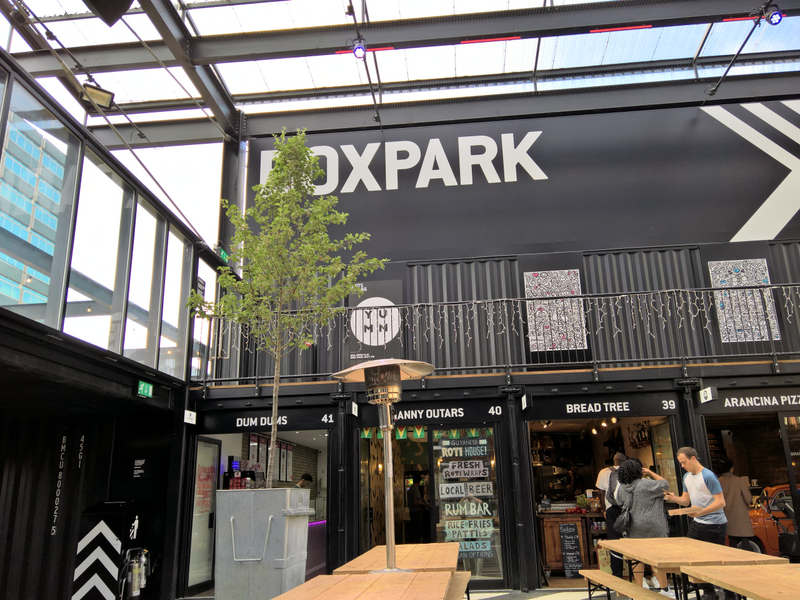 The sort of 'contemporary space' that you really wouldn't ever associate with Croydon. Until now. This has been, without doubt, the most depressing Election Campaign in history. Not necessarily the most depressing Election - that was 1997, obviously - but back then defeat was entirely expected and the scale of it surprising, so these things in equal measure lent themselves to a campaign of numb resignation. Theresa May has had a disastrous campaign. Whatever her credentials for actually running a country, winning voters over is clearly not her strong suit. Her brand of Conservatism is rather distant from my own Libertarianism, but I was willing to let this go when it looked like she might deliver a landslide. With hours to go, it doesn't look like that will happen. And I want a landslide. I want something like a 180 seat Tory majority. I want us to have disproportionate representation far beyond our vote share. I want other parties ganging up against the opposition rather than against us. I want high-profile entertainers and musicians and comedians to come out for us. I want Labour supporters to feel as despondent and dejected and desperate as they made me feel in 1997 and 2001. For me, it's about revenge. It's about jealousy. It's about having what they had. I want them to wake up covered in sick feeling like the end of humanity. Godmother Theresa doesn't really look like giving me much of that now, and given the ebb and flow of politics and my generally not-brilliant health, I shall probably be dead before such a Tory landslide is ever achieved. That's right. Dead. You cunts win. Jeremy Corbyn, on the other hand, has enjoyed a hugely impressive campaign. I might disagree with much of what he stands for and despise the bullying, debate-stifling way in which some of his supporters conduct themselves, but he has stuck to the task, is a dogged and resiliant campaigner, and has apparently closed the gap in a way that nobody thought possible. There is a lot of speculation that the tightening polls don't account for our strategic game on the ground and that we are out-performing a national picture that isn't as rosy for Labour. That's as maybe, but it's still no landslide. A very modest Tory majority of about 36 or 40, possibly even less. Several strange results as different seats do radically different things to one another. Some very good MPs on both sides lose out unfairly as marginal seats change hands. I'm particularly worried for Gavin Barwell in Croydon Central. Labour vote share holds up reasonably well and Corbyn pisses off most of his MPs by staying on as leader. Social media, already sickeningly one-sided, becomes utterly intolerable. SNP retain about 50 seats in Scotland, most occupied by, basically, children. UKIP wiped out, and Lib Dems fail to launch any kind of comeback, winning only six or seven seats. I try to have a good time helping out the excellent candidate Dan Watkins in Tooting, and avoiding anger and Merlot. Very, very few people will be genuinely happy on June 9. Nobody will feel they've made much progress. I will be drinking beer and hopefully punching the air.